Today we go ‘off road’ with ex-Hassell designer and one of Sculpture by the Sea’s favourite sculptors, APRIL PINE. Could you start off by telling us a little about your architectural background. I worked for architect Robert Andary part-time whilst completing my masters. Graduated from Curtin University in 2010, receiving all three academic awards. Then worked at international firm HASSELL for 6 years, working in the design phase across multiple typologies. Why did you transition away from the profession to being a full-time sculptor? The demand for my sculpture works meant I could no longer continue working in both industries. Success from showing in Sydney meant I could transition full time. Much like in architecture school, Pine produces a lot of sketches and test models before going to full scale. Pine uses her expertise in 3D modelling software acquired from her time in architecture to develop her designs. 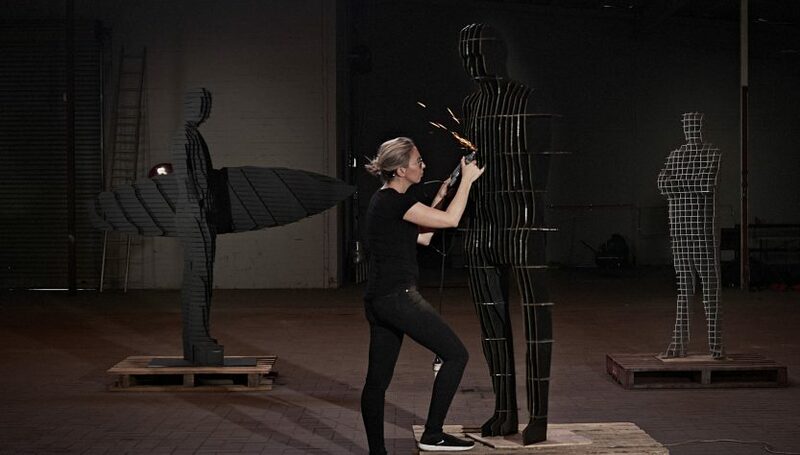 Has your time in architecture provided you with the skillsets you need to become a sculptor? Yes, my skills in architecture around design communication, clarity of idea and expertise across multiple 3D and image creation software suites are extremely valuable in my art practice. 30% of my work is for public institutions or governments. So, my ability to be professional and follow up with drawings, details and reports make me a strong candidate when winning work. There are some very prominent ‘architectural’ qualities in your work, could you describe how your time in architecture has informed your style. Clean ideas executed well, instead of large ideas constructed poorly. Creating work that has a timeless quality to it. Being edited and refined, less is more. Working with the idea of void and mass, as well as expression of perspective and movement. ‘Shifting Horizons’ changes according to the viewer’s perception. Photographer: Emily Lim. The idea of playing with transparencies, creating different perspectives for your viewers and connecting to the surrounding context, is that something that stemmed from your studies? Yes, I have always been interested in movement and how architecture and art is considered and experienced via a sequence of spaces. Having worked in the profession, do you think overworking, underpayment or gender inequity are issues in the workplace? It’s a tough industry, both women and men generally overwork. I didn’t experience gender inequity whilst at HASSELL and was recognised for skill. I think this job is certainly harder to do once you have a family, however from what I observed at HASSELL there was a lot of encouragement. A couple of Pine’s sculptures looking very at home in the Australian bush. Why do you think so many graduates don’t continue onto be Architects? I suspect that the effort to reward ratio is not quite right. Architecture is a team job and your career is more of a marathon, not a sprint. It’s definitely a long-term game. What advice do you have for students or graduates who aren’t sure whether professional architecture is the path for them? Architecture is a fantastic degree that teaches you to think creatively about ideas, communication and problems. A degree in architecture can translate to multiple fields whether that be design, construction, art or even editorial/advertising, etc. Most people have 3-4 careers over their lifetime, so just start on the journey you know now, work as hard as you can and do your best work. April Pine, March 2019. Interviewed by Emily Lim. All images are April Pine’s, unless otherwise stated.